What a blog! A big hurdle to be overcome: music's use to further distinguish, even exalt, a given class distiction. Even in ancient Greece, there was 'elitist' music. Today, rap a genre of primarily non-eltitist society, occupies a powerful vantantage point for influence. Well funded and world wide, rap is turning music, eltism, and influence, on its head. But what is built on sand gets pumelled by the storm of time. Posted by Sostenuto (sic) to my article Music and politics. Whenever a thoughtful comment like that is added I click through to the poster's own blog. Sostenuto describes himself as 'a violinist in his early stages as a composer. I consider my musical influences to be Bach, Messiaen, Monteverdi (early music in general,) Schoenberg, Hindemith, Stravinsky, Mozart, Glass and the like. I'm currently studying music performance with Mathias Tacke of the Vermeer Quartet along with compositional studies.' With those musical influences he'd probably qualify for a mention here anyway, but it was the name of Sostenuto's blog that caught my attention - A musical mind map. That produced one of those blazing 'why didn't I think of that moments?' for me. I tried in one of my first ever posts, Serendipity and Collaborative Filtering, to articulate what On An Overgrown Path is about. 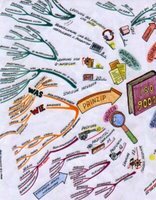 For anyone that hasn't come across mind maps they are a form of non-linear radiant presentation that allows the fast exploration, and development, of an idea while simultaneouly maintaining clear focus on the central themes. Interestingly, although mind maps have been around since at least the 1970s their topography approximates closely to the navigation map of a website, and as the illustration here shows a mind map has striking similarities to the architecture of some contemporary music. 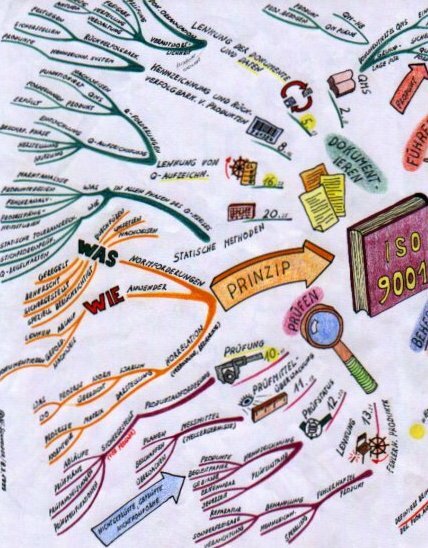 Now I've used mind maps extensively in my day job, and in fact my current project started from just one mind map. But I had never seen the blindingly obvious - On An Overgrown Path is a non-linear interlinked exploration of themes, just like Sostenuto's blog it is a musical mind map. This non-linear path leads me to yet another musical destination. Last night was one of those very rare moments when the musical and theatrical planets aligned to transcend what Wilhelm Furtwängler described as 'the hoar frost of routine'. 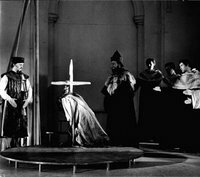 Benjamin Britten's church parable Curlew River is an elusive work that is dauntingly difficult to pull off in a live performance. The role of the Madwoman will always prompt comparison with the singer it was written for, the incomparable Peter Pears. The modest scoring for just seven instruments, with its remorselessly exposed passages, makes extraordinary demands on the players, while the composition is so venue specific (see Britten – music does not exist in a vacuum) that it only works in an acoustic very similar to that of the East Anglian church of Orford where it was first performed. 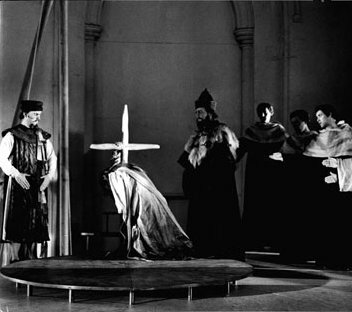 And an excellent recording, production photographs and living memories mean Britten's original presentation is always there for comparison, and my photograph above shows the original production with Pears as the madwoman prostrating himself at the foot of the cross. 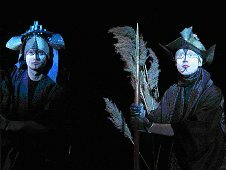 Mahogany Opera are not a company to shirk challenges, and they chose a venue closely linked to Britten to premiere their new production of Curlew River. Holy Trinity Church, Blythburgh is not only an architectural wonder in its own right, it is also a short distance from Aldeburgh and Orford, and it is a church Britten himself knew well as it was here that the 1969 Aldeburgh Festival was transferred to, including an aclaimed production of Idomeneo, after the original Snape Maltings concert hall was destroyed by fire - see Music will rise from the wreckage. 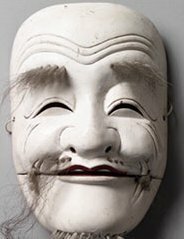 Of course Curlew River is a musical mind map par excellence, a non-linear exploration of plainsong, Japanese Noh theatre, medieval religous drama and 20th century musical vocabulary. Mahogany Opera's Director and Producer Frederic Wake-Walker grasped these disparate threads and welded them together to deliver one of the most memorable evenings of music drama that I have ever been priviliged to attend. From the moment the opening plainsong 'Te lucis ante terminum' drifted in from the churchyard and the performers processed in through the west door of the darkened 15th century church it was clear that this performance was going to be an 'out-of-body' experience, and the next 70 minutes did not disappoint. This was Britten delivered by an inspired group of young performers who shared much with the original 1958 performers. Frederic Wake-Walker is just 25, he was brought up in Suffolk and sung as a treble in Britten operas at Snape. He recently graduated from Edinburgh University with a Masters in Philosophy and Systematic Theology, is now a staff director at Glyndebourne, and has worked in other opera houses with Franco Zeffirelli, John Cox, and David McVicar. Musical Director Nicholas Collon recently graduated from Clare College, Cambridge where he was the Organ Scholar reading music. His performers consistently maintained the high standards demanded by Britten's writing. John McMunn, the excellent Madwoman, is an alumnus of Harvard, and he has just graduated from King's College, Cambridge where he was a choral scholar. Designer of the visually stunning production, from which the two production shots above are taken, is Mara Amats who was born in Latvia, was apprenticed to the monk and iconographer, Gregory Krug, at the monastery of Our Lady of Kazan near Fontainbleu in France, trained restoring icons and frescoes in Ethiopia, and spent many years working with craftsmen and artists in impoverished areas of Africa, India, Nepal, the Caribbean and Central Asia. The production poster by Maria Amats which I reproduce below uses reeds which grow in the rivers and marshes around Britten's Aldeburgh. Mahogany Opera is a company to watch out for. 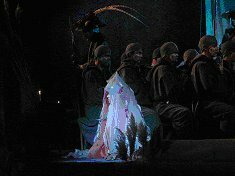 They will be following Curlew River with Noye's Fludde in 2007, and their future plans include the UK premiere (plus a performance in Berlin) of Boris Blacher's Abstrakte Oper Nr 1, the world premiere of Capital Transfer by Kenneth Platts, a choreographed production of Schoenberg's Von Heute auf Morgan, and a new Greek opera by Evangeli Rigaki called The Last God with a libretto by the muti-talented Frederic Wake-Walker. 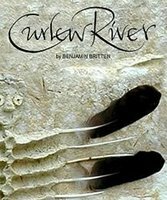 This new production of Curlew River is an important milestone from an exciting new professional company. Catch it if you can in the much bigger performing space of Southwark Cathedral, London on August 22, Holy Trinity, Melford, on August 24, and All Saint's, Burnham Thorpe, Norfolk, August 26 & 27. For more details follow this link. Thank you Mahogany Opera for a truly magical evening of music making, and thank you Sostenuto for sparking this particular musical mind map. And do return here tomorrow for an article on racial elitism in music. Very nice write-up about one of my favorite pieces of music, and I envy you the production. I've yet to see and hear it done well live so I guess I'll just have to produce it myself eventually. I also would have loved to have seen this production. The top photo of the new production reminds me a bit of the masks used in 1986 London premiere of Birtwistle and Zinovieff's Mask of Orpheus. I believe that British designer Alison Chitty may then have been involved in the mask-making, but I am not positive. What on earth is a "choreographed production"? It's hard to credit, but VHaM is a comedy and should be paired with Die Gluckliche Hand and the great Ewartung (the whole evening would be less than 1 1/2 hours of music). Pliable, was the Curlew River filmed by chance? Henry, there was a video camera filming at Blythburgh. I've asked Frederic Wake-Walker if this video was for the use of the company or whether it will be generally available. I think you've gotten some of your facts muddled as a result of the general availability of incorrect information about myself batting around the internet. First, I was never actually the Milky Bar Kid. This was a joke included in a gag biog used by the King's Choral Scholars' a cappella outfit, Coll Reg, to take the piss out of my American citizenship and my rather red cheeks. Second, I was a tenor Choral Scholar as King's, not the Organ Scholar as you suggest. Although it would be rather impressive if I had been the Organ Scholar - singing Organ Scholars are lamentably rare indeed! Thank you for your thoughtful review of Mahogany's CURLEW RIVER. We're all very pleased that the show has received such a warm reception. Thanks John, I think the moral of that story is that if you put information on the internet people believe it! I'll do an edit asap. That's potentially good news Pliable about a possible future DVD release. I'd love to see a DVD with all three Church Parables on it.